They would chase Krishna and try to catch Him, saying, “Here is Krishna stealing butter,” but Krishna would flee and enter another house, where He would again devise some means to steal butter. Then the cowherd men would again try to capture Krishna, saying, “Here is the butter thief.” And they would be angry. But Kṛṣṇa would simply smile, and they would forget everything. The narration of Krishna’s naughty childhood activities would be presented to mother Yasoda in the form of complaints. Sometimes Krishna would enter the house of a neighbor, and if He found no one there, He would release the calves before the time for the cows to be milked. The calves are actually supposed to be released when their mothers are milked, but Krishna would release them before that time, and naturally the calves would drink all the milk from their mothers. When the cowherd men saw this, they would chase Krishna and try to catch Him, saying, “Here is Krishna doing mischief,” but Krishna would flee and enter another house, where He would again devise some means to steal butter and curd. Then the cowherd men would again try to capture Krishna, saying, “Here is the butter thief. Better capture Krishna!” And they would be angry. But Kṛṣṇa would simply smile, and they would forget everything. Sometimes, in their presence, Krishna would begin eating the curd and butter. There was no need for Krishna to eat butter, since His belly was always full, but He would try to eat it, or else He would break the pots and distribute the contents to the monkeys. In this way, Krishna was always engaged in mischief-making. If in any house Krishna could not find any butter or curd to steal, Krishna would go into a room and agitate the small children sleeping there by pinching them, and when they cried Krishna would go away. In enjoying Krishna's attitude of stealing butter very stealthily, Mother Yasoda experienced the ecstasy of maternal love by smelling His head, sometimes patting His body with her hand, sometimes offering blessings, sometimes ordering Him, sometimes gazing at Him, sometimes maintaining Him and sometimes giving Him good instructions not to become a thief. Such activities are in maternal ecstatic love. 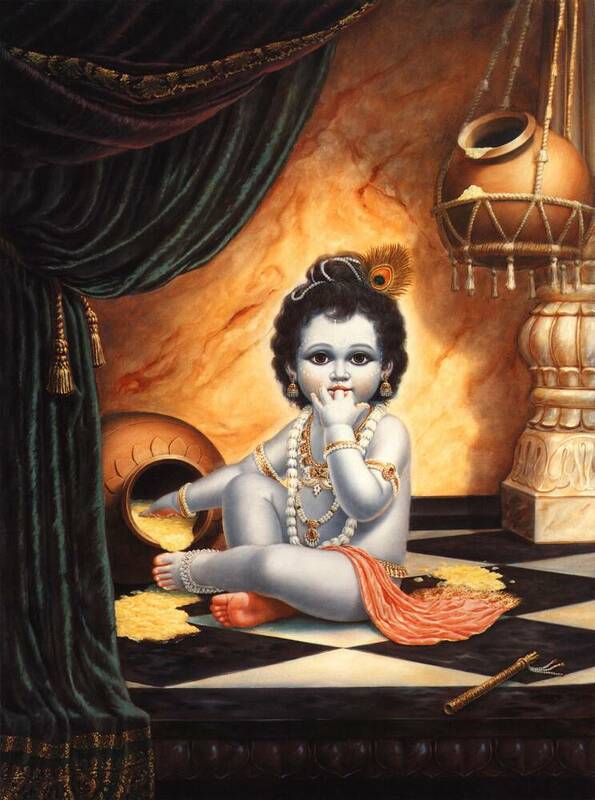 An important point to be observed in this connection is that the childish propensity of stealing is there even in Krishna, the Supreme Personality of Godhead, and therefore this propensity is not artificial. However, in the spiritual relationship there is no inebriety to this stealing propensity, as there is in the material world.